Add stylish edges to your pies, pastries, or pasta with this Ateco 1397 pastry cutter with 1 3/8" fluted wheel. Made of durable stainless steel, this blade easily cuts through thin dough and leaves behind an elegant, scalloped edge. This cutter's petite design makes it perfect for intricate detailing or small cuts. You can even use the side of the cutter for a unique fan texture along your crust. The Ateco stainless steel pastry cutter makes cutting pies crust really easy. The edges of the pies look really nice. I also use it to cut lasagna. The wooden handle is also very comfortable. I do not use this type often so I feel it will be just fine for my few pies. However, I did find it a bit shaky - or maybe it was my old hands! These are so adorable and help create the perfect fluted edge for a pie. The best recommendation is to cut your pastry using this and then allow your pastry to cool in the fridge for a little while so the scallop edge holds while baking. Very nice pastry cutter for the price. It is NOT dishwasher safe so be aware of that. The metal will disconnect from the wood - the adhesive melts in the dishwasher. Keep that in mind and you are all set. Love this pastry cutter not only for pies and such but also for fondant decor that requires the wavy texture around a cake. I love how the wheel is set in place correctly so it does not feel like your hand is waiving with it was it goes. This stainless steel pastry cutter is another great product from Ateco. It is small enough that you have the control for making delicate decorative designs with pastry dough. I also like to use this for cutting out ravioli. It has the perfect fluted edges for a fancier more professional look. I bought this for cutting pie crusts and other pastry doughs. It works okay, but the wheel is pretty wobbly and the the metal part on the end of the wooden handle was lose and slides up and down on mine. This product is very high quality - the wooden handle feels very sturdy and the wheel cuts through pastry and pasta easily. I definitely recommend! I have been using my Ateco Stainless Steel Pastry Cutter for over one year now and it is still holding up great. I love to use this on shortbread dough to give cookies that little extra detail. Money well spent. I make my own pizza dough and I love for it to have a rustic look. This fluted wheel will help me to quickly prepare my dough (and control rise) on the hot stone so that I can get it quickly into the oven to start browning and crisping (I used to just use the tongs of a fork). Then, after 5 minutes, I take it out, add on my pizza toppings, and pop it back in the oven to bake. Handy pastry cutting tool that I can also use for cutting fondant. Handle is easy wooden but smooth so it is easy to hold and clean. Great little cutter for the price. I have used it for pasta and pastry dough with no problems. The only con is that the wheel is a touch wobbly, so care is needed to keep your line straight. i make a lot of pasta and have been working on pastries so cutters like this fluted wheel are helpful. generally speaking ateco makes really solid products. this fluted wheel is decent, but the attachment isn't held one super securely so it doesn't exceedingly sturdy. it gets the job done though. Dinky little pastry cutter but for the price I'll give it above average. The wood handle is nice and solid and has a glossy finish. The actual cutter wheel is small but that was as expected from the description. Its not super sharp but it does it job and serves it purpose for me. I don't have use for it too often so for me its good given the price point. If you plan on using it often, you might want to go for the more expensive as you get what you pay for the quality doesn't feel like it would withstand heavy usage. Either way, good bang for the buck. I absolutely love this product! 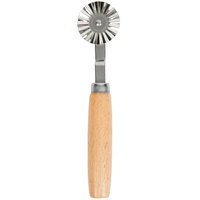 This ateco stainless steel pastry cutter with fluted wheel and wood handle works great! The cutter cuts very clean. Great quality! This is great for cutting edges, lattice, and more. It's sturdy and cleans easily, not everything does with some dough. It's sturdy and seems like it will last quite some time. Sturdy, easily washable, and a great price this wheel is great. Makes cutting both pasta and certain pastry items an ease. We use this everyday and hasn't shown signs of wearing out. I use this for homemade ravioli and it cuts through homemade pasta very cleanly. After 2+ years of use, it is still holding up strong. I love it. Gives my pastries a professional look. Earlier I used a fork now I use this pastry cutter for the same look. Saves my time and energy. Decent pastry cutter. The wheel is not as sharp as I would like it to be, but it gets the job done and is inexpensive. This is a nifty little item and good quality tool. Great for pastries and home-made crackers. Also gives a nice finish to pot pies, when used sideways and depressed into the edge of the crust. Would recommend this little gadget. This is the perfect item for crimping edges or leaving a lace edge on you pie lattice. I fully recommend this product for all your needs. This a little work horse for my bakery, It cuts pie dough or pastry so quick and effortless, I am always using it when I bake my lovely baked goods. I use the cutting wheel for cutting my ravioli's. Its perfect for what it was intended to be used as. I would purchase again if I needed another one. The Ateco 1 3/8" Pastry Cutter is one of the few disappointments we have ever gotten from Webstaurant Store. The fluted wheel is not riveted onto the handle very well and the wheel weaves and wobbles as it cuts. I have little control making straight cuts for ribbons of crust. A bummer! Thank you for your review! We are sorry you did not like the pastry cutter you purchased. For one that is more heavy duty, try this Ateco pastry cutter. I do like my ateco flutend pastry wheel. It is good for pie doughs and many other decorative applications. However, I find that the wheel wobbles a fair bit and I don't see a way to fix that on my own. Kind of dissappointing for an Ateco product. Perfect little tool to trim pastries while providing clean edges. This gives a clean and professional presentation to my meat pies. Use for homemade pasta and dumplings, too. As long as you don't mash down when cutting pastries, this thing will give you many years of service. The only place I see a problem is the rivet holding the wheel on. There is only the one metal piece holding the wheel so the rivet will loosen-up over time and eventually fail. It's cheap enough that I'm not worried about that though and I'm confident I won't have to worry for at least a few years. Love my Pastry Cutter. Just the right size and I feel so fancy. I love the fluted look. It is well made, I have used it many, many times and it is no worse for wear. It washes up well also. I bought this to make homemade pies look prettier, which it makes lattice top strips beautifully. I also have found that it replaces an antique pie tool that I had to make the crust look as awesome as the top. One of my go to tools for many things from pies to pastas and even cookies. This is a great tool for creating a fluted edge on cake decorations. It can be rolled gently to emboss or use more pressure to cut through. I use this for pasta sheet, fondant or anything that is thin. The wavy it gives is very nice and sharp not dull at all. This Ateco 3/8" pastry Cutter with a fluted wheel is an excellent little tool. The wooden handle is sturdy, and the whole product seems well made.